Multi-hypervisor environments are becoming far more common, and every once in a while, it becomes necessary to move a virtual machine from one platform to another. There ways to perform such a conversion manually, but it is a messy process. 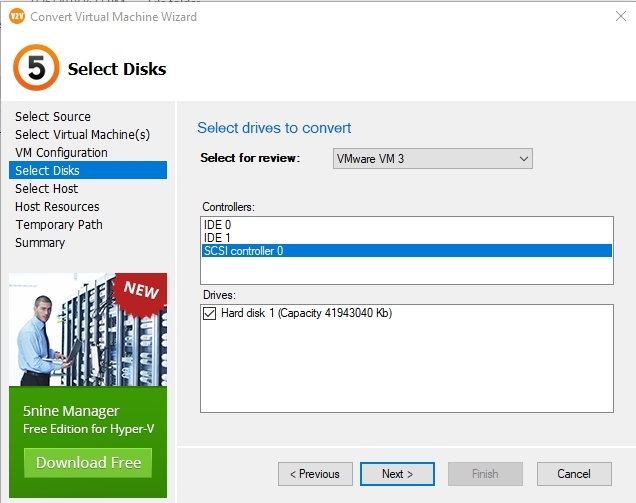 However, 5Nine offers a free virtual machine conversion wizard that you can use to convert VMware virtual machines to Hyper-V. You can download the tool here. 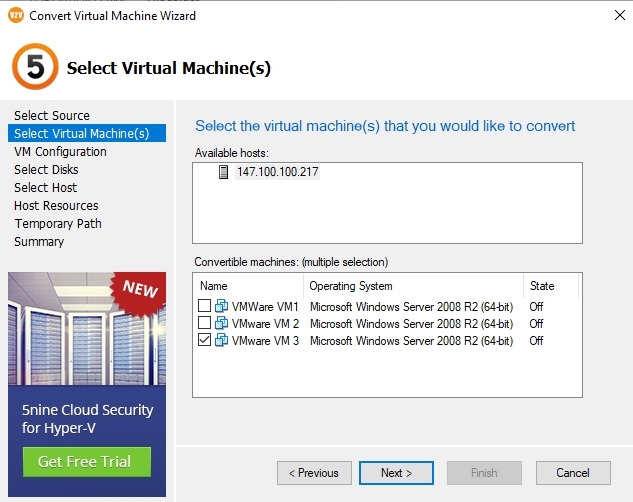 Once installed, the Convert Virtual Machine Wizard walks you through several steps in the virtual machine conversion process. The first step is to enter the IP address or name of your ESXi server, along with a set of administrative credentials, as shown below. Click Next, and the wizard will connect to your VMware server and show you a list of the virtual machines residing on that particular host. Select the checkboxes corresponding to the VMware virtual machines that you want to convert, as shown in the next image. The next screen that you will encounter asks you to provide a bit of information about how you want the virtual machine to be converted. Specifically, you will need to enter the virtual machine name that you want the VM to use once it is moved to Hyper-V. You will also need to specify the virtual machine generation (although this option is sometimes grayed out), as well as the number of processors and the amount of memory that you want to assign to the VM once it has been converted. The wizard also gives you the opportunity to select an automatic start action and an automatic stop action, as shown in the image below. Click Next, and you will be prompted to choose the disks that you want to convert. The options that are shown on this screen vary a little bit depending on how the virtual machine is currently configured. In my case, the wizard shows two IDE controllers and a SCSI controller. Clicking on a disk controller reveals the virtual hard disks that are attached to the controller. As you can see in the next image, for example, my virtual machine has a virtual hard disk that is attached to SCSI controller 0. Selecting the checkbox corresponding to this virtual hard disk ensures that the virtual hard disk will be included in the conversion process. Click Next, and you will be taken to the wizard’s Select Host screen. This is where you enter the name or the IP address of the Hyper-V host to which you wish to move the converted virtual machine. Unfortunately, the wizard does not seem to allow you to enter the IP address of a System Center Virtual Machine Manager Server. 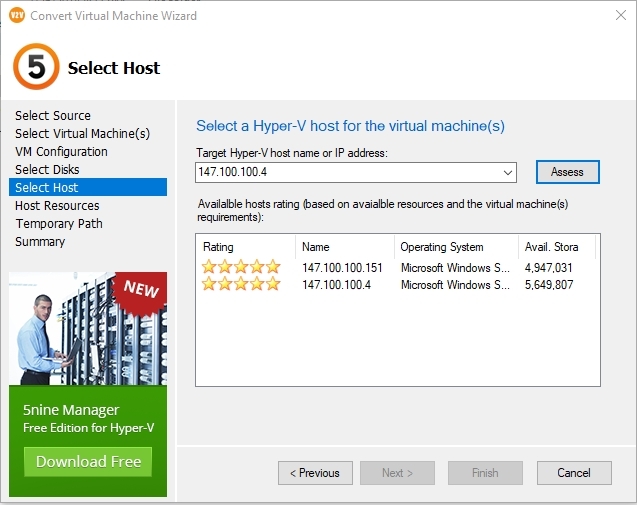 You can, however, enter IP addresses for multiple Hyper-V hosts, After entering each IP address, click the Assess button. This will cause the wizard to evaluate the host’s suitability for hosting the virtual machine that is being migrated. Incidentally, you may be prompted to enter a set of administrative credential when evaluating a host server. The image below shows what it looks like when you specify multiple Hyper-V hosts. As you can see, you are free to select the host that is best suited to the needs of the virtual machine (or virtual machines) that you plan to migrate. 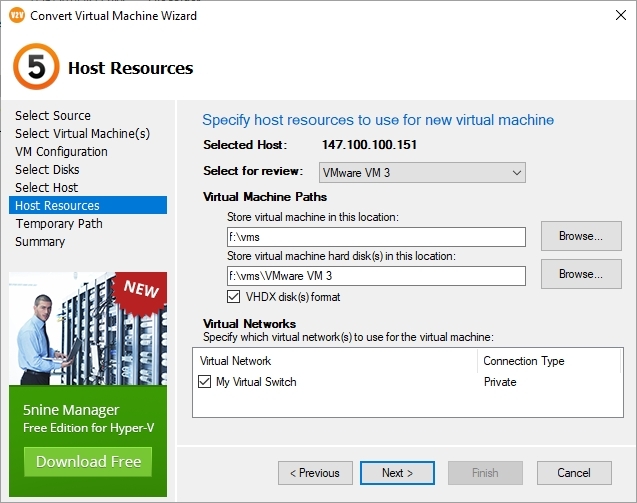 After selecting a Hyper-V host to use for the virtual machine placement, you are going to need to provide a bit more information about how the virtual machine will use the host’s resources. As you can see in the next image, you will have to provide the storage path to be used by the virtual machine, and by the virtual machine’s virtual hard disks. This screen also contains a checkbox that if selected, will create a virtual hard disk in the VHDX format. 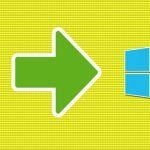 One last thing that you must do before moving on is to select the virtual switch that will provide network connectivity to the virtual machine once it has been moved. Although these are the only options that you have to configure, there is one element of this portion of the wizard that is easy to overlook. If you look at the image below, you will notice that the virtual machine name is listed on a drop-down menu. 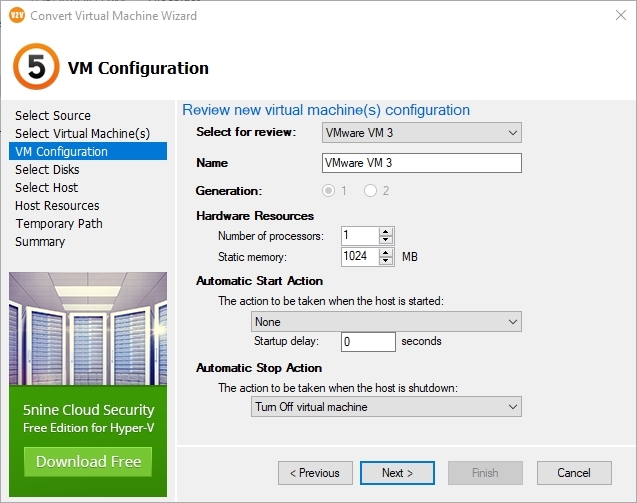 This drop-down list allows you to select a specific virtual machine, which means you can set the virtual machine paths and the virtual network connection separately for each virtual machine that you are migrating. Click Next, and you will be taken to a screen that asks you to provide a temporary storage location. The wizard will need to temporarily store some data on your PC or on an attached network drive (or external hard drive) during the conversion process. This screen prompts you to choose the storage location that you wish to use. Click Next, and you will see a summary of all of the options that you have specified. Assuming that all of the summary data appears to be correct, click Finish to begin the conversion process. The Convert Virtual Machine Wizard seems to do a good job of converting VMware virtual machines into Hyper-V virtual machines. 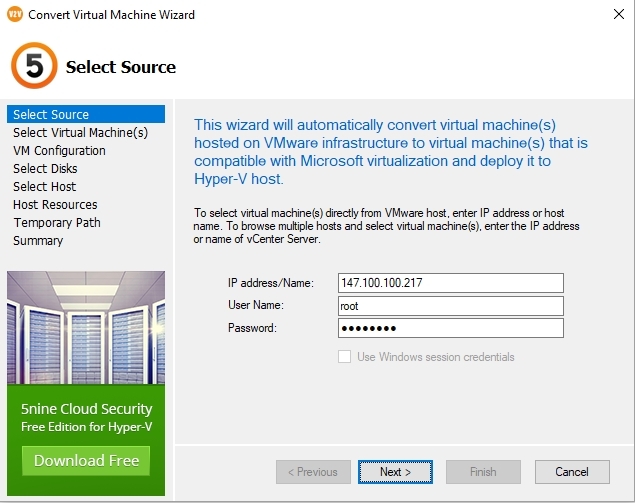 Unfortunately, the wizard cannot convert Hyper-V virtual machines into VMware virtual machines. 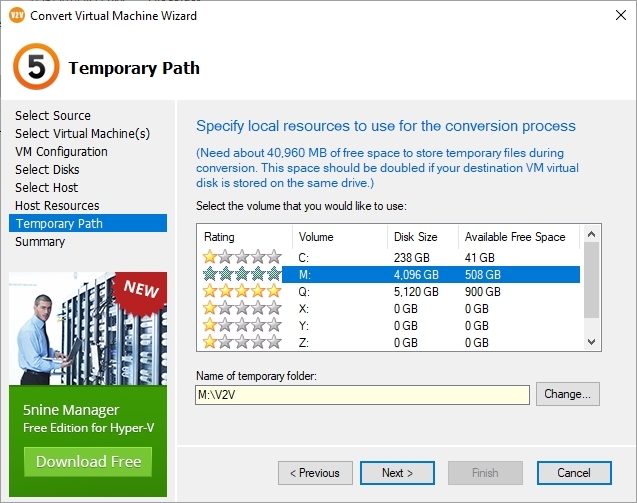 However, 5Nine does offer a commercial conversion utility called V2V Easy Converter that can migrate VMware virtual machines to Hyper-V, Microsoft Azure, and AWS. The tool can also migrate Hyper-V VMs to AWS and to Microsoft Azure.